The Birmingham Barons are proud to announce their schedule for the 2019 Southern League season. The Barons start the season on the road against the Biloxi Shuckers on Thursday, April 4, before returning to Regions Field for Opening Night against the Tennessee Smokies on Wednesday, April 10. The Barons will play 70 home games in the Magic City across 12 homestands, including a season-long 10-game set from May 28-June 6 against the Montgomery Biscuits and Jackson Generals. Birmingham will be on the road for a 10-game stretch just once, from May 6-15 against Jackson and Tennessee as part of their 70-game road schedule. The home slate includes 13 Thursday night games, including an Independence Day Celebration on July 4 against the Pensacola Blue Wahoos at Regions Field. Weekends will be eventful as well, as the Barons are home for 11 games each on Friday, Saturday, and Sunday. Exciting promotions such as Thirsty Thursday and Friday Night Fireworks will return to make Regions Field the place to be on the weekend. T-Shirt Tuesdays will also return as the Barons are set to play seven Tuesday home games during the 2019 season. After starting and ending the 2018 season on the road, the Barons will conclude the 2019 campaign at home with a five-game series against Biloxi from August 29-September 2, with the season finale coming on Labor Day. The 2019 campaign marks the 25th anniversary of Michael Jordan's season with the Barons in 1994. Special promotions and theme nights will honor Jordan's time in Birmingham throughout the season. Game times, promotions, and the date of the 23rd annual Rickwood Classic, will be announced in the coming weeks. For more information about group outings, season tickets, and hospitality options at Reigons Field, please call the front office at (205) 988-3200. 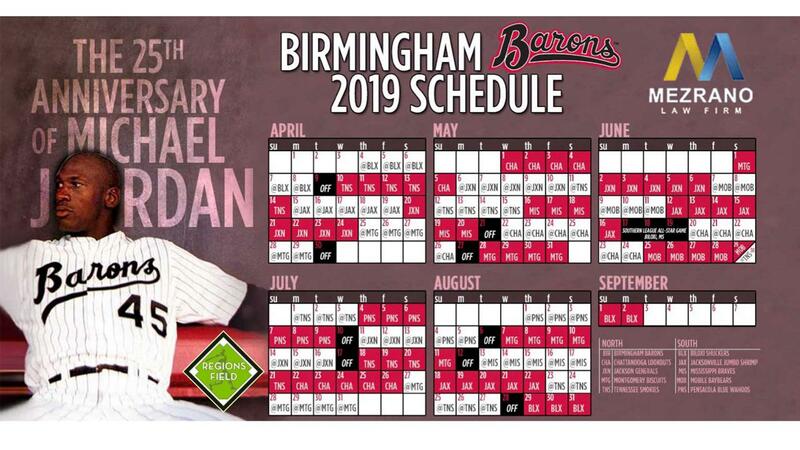 CLICK HERE TO DOWNLOAD THE 2019 BIRMINGHAM BARONS SCHEDULE!